For me, the downside about being into skincare is that a lot of the products I'm interested in are a world away from what I can realistically afford. Yes, I am naughty sometimes and I do occasionally buy things I probably shouldn't and then justify it in my head with thoughts like 'I'm hormonal - it's cool' . In general though, there are usually more important things than my face that need funding. May Lindstrom is one of those pricey but devastatingly covetable skincare brands that falls into the must-try-everything category but doing that is going to cost almost £600, so...nah. I have, however found a way that I can try everything from May Lindstrom that doesn't involve robbing a bank, selling a kidney or obtaining a new identity to evade debt collectors. 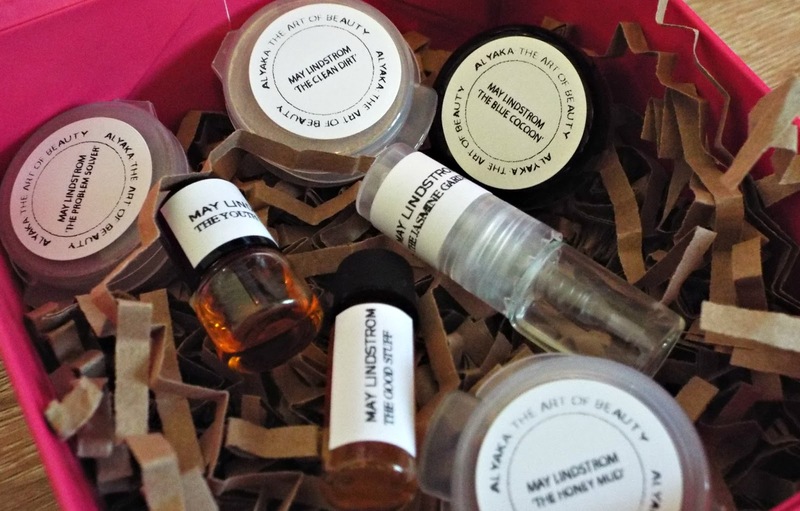 Enter the Alyaka May Lindstrom Sample Kit. So these samples are teeny tiny and obviously won't last you long but I think it's a brilliant way to really discover a brand and decide if you'd invest in the full sized products. The box costs £22 with free delivery - this may seem a lot but it's a heck of a lot cheaper than dishing out the big bucks for a product you've never tried and may not actually like all that much. The real kicker with this sample kit is that you receive a code with it that essentially refunds you if you choose to buy something from the brand. So, for example if I wanted to go ahead and purchase The Blue Cocoon (which is currently being all lovely and melty on my face as I type), I would get £22 off. Not a bad deal if you ask me. I received the box today and have so far tried out The Problem Solver mask (which used up the whole pot), The Good Stuff Radiance Oil, The Jasmine Garden Mist (still a good couple of uses left in it) and The Blue Cocoon, which I think has two or three more uses left in it. So I've had a nice little pamper and don't fill sick for spending a lot of money, because I haven't. Alyaka also do sample boxes of a range of other brands but you can find the May Lindstrom one here. *Edit- Nov '16: I'm not sure Alyaka are still stocking May Lindstrom though it could be temporary/ they've run out of stock. I wanted to see close up what this box offered, great post! Amazing pics too!